In the month between denying Robert Van Tuinen the right to distribute copies of the Constitution on Constitution Day and the filingof his lawsuit (PDF), there was virtual silence on the Modesto Junior College campus about the incident. Then W.J. Holly, an adjunct professor of philosophy, wrote an eight-page email to his colleagues on October 15, 2013, supporting Mr. Van Tuinen. Professor Holly, who has a doctorate from the University of California, Irvine and has been teaching part-time at Modesto for 14 years, called upon his colleagues to recognize the gravity of the First Amendment violation that had occurred. Extensive excerpts of Professor Holly’s letter are copied below (edited only for length and format). While we regret that we only have one faculty voice to share with you, Professor Holly’s letter is as passionate and compelling as any First Amendment advocate could wish for. But judge for yourself. The paper attached above (Destructing Causal Deconstruction) exposes some of the absurdities that are committed in the name of “Deconstruction.” … One question that I cannot answer, however, is whether or not I would be arrested by a security officer if I insisted on wandering about the quad on our campus, handing out copies of this paper and discussing it with those who might be interested in the topic. This is not a silly question. For, as you will find if you read below, one of our students recently was denied the right to distribute copies of the Constitution on this campus on Constitution Day. He was blocked in the exercise of his freedom in this regard, both by campus security and by an official from Student Services. As I say, my paper on Deconstruction is amusing. The following remarks on freedom of speech are not amusing. If I have said anything that offends anyone in what follows, I beg their forgiveness in advance. 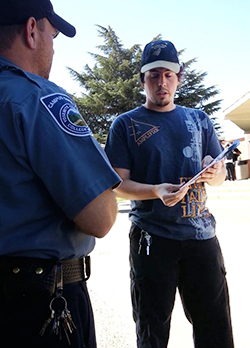 Nearly a month ago (Sept. 17th) one of our MJC students, Robert Van Tuinen (also a veteran), was trying to pass out copies of our federal Constitution on Constitution Day. He was prevented in this exercise of free speech by an MJC security officer and then by an official at the office of Student Services who told him he was allowed freedom of speech and the right to pass out literature only in certain tiny restricted areas on our campus, and then only after booking a reservation — which would not be available until the following month! I am puzzled why there has been no faculty outcry over this ugly incident. Why are we not standing up for our student who only wanted to exercise his constitutional right to free speech? Do we really want to be known nationwide as the college that wouldn’t let a veteran pass out copies of our Constitution on Constitution Day? While this news has not even been mentioned on our faculty mail site, it has given our college a black eye all across the nation. … None of this [extensive media coverage] has shown up on our faculty website. Why not? It seems to me that protecting our students’ rights to freedom of expression should be of paramount concern to all of us. If we need to be reminded of the importance of Freedom of Thought and Expression in a democracy, and in an institution of higher learning, we need only review J.S. Mill’s arguments in On Liberty that have been used to explain how only in an atmosphere of free discussion and free exchange of ideas can we develop our powers of judgment and have access to information that would enable us to know the truth and to develop our human excellences. An institute of learning without freedom of thought and expression and full exchange of information is simply not an institution of learning. It seems to me that we should give President Stearns our full support in rectifying this unfortunate situation[.] There are however a couple small points that are cause for small wonder: First, it is unclear what she means when she addresses “those who were offended by the appearance of censorship.” Van Tuinen was not subjected to the mere “appearance of censorship.” He wassilenced and he was prevented from distributing his literature. That is outright censorship, pure and simple, whether it resulted from a misunderstanding or not. Third, we are told that a formal apology has been provided the student. It seems to me, however, that apologies in such cases are best made in public. … And, since the violation of the rights of one of our fellow citizens violates us all, I believe that we all are entitled to see a copy of that apology, to see the particulars of the concessions made, and to see in what manner those liberties now are affirmed that then were denied. Besides, the apology seems not to have had one of the effects I would have hoped for: The lawsuit apparently has not yet been dropped. That is evidence that it was not an adequate apology. What about people calling us Nazis? Again, why be so hurt and surprised at being called Nazis when we are restricting people’s liberties? This isn’t what people expect from representatives of the law in this, these United States of America, in this land of the free and the brave. Instead of complaining that some (probably anonymous) people called our friends Nazis, perhaps instead we should commend Van Tuinen for his admirable restraint when he was blocked by a police officer, and told by a representative of this school that he had no right to distribute copies of the Constitution in a public place without first getting advance permission from a college administrator. Why should he be required to get advance permission from a bureaucrat to share his beliefs with others on the campus of an institution of higher learning? Who treats people like that? Nazis do. Communists do. The Taliban does. We don’t expect Americans to act that way. That is why the word “Nazi” springs to some people’s lips. Of course we likely will have to pay Van Tuinen’s lawyers’ fees, but the sooner this is settled, the less those fees will be. But, what about punitive damages? If he doesn’t really care about money, if he just wants public acknowledgement that he was wronged, perhaps we should offer this: Buy him a couple thousand copies of the Constitution or of the Bill of Rights, and offer to make the individuals he has sued do community service that is relevant. Make them each do twenty hours of community service that consist of passing out copies of the Constitution and explaining to people the importance of everyone’s right to free speech. That ought to make him whole. And, to show my sincerity, I hereby offer to do 20 hours of such community service myself. Perhaps I too bear part of the responsibility here, because this one flew under my radar too. I did not check to see if my students’ rights to free speech were properly protected. Sometimes the implications of rules just do not strike us until we see them enforced. Now, if you do not like my suggestion that we should have a policy of completely free, unfettered and unqualified freedom of thought and expression on this campus, just ask yourself this one question: Suppose that Thomas Paine, the great pamphleteer (“These are the times that try men’s souls…”) were to come to MJC. Would you make him show his ID or make an advance appointment? Would you sic campus security and Student Services on him before allowing him to distribute his literature? … I say, Let Freedom Reign!